Because for some folks, linguistic ambience is everything, I’ve decided to call this hunky brute: the “Sagma”. According to the Google, that’s Latin for saddle. All very erudite and tickety-boo, I am sure. The sagma joins the stock and the ladder together with great strength. Note how the tight inside corners of our new sagmae, mimic the sharp rectilinear lines of these exact duplicates of the Elenovo kambestrion, seen below. Ain’t Latin the shiz, though. 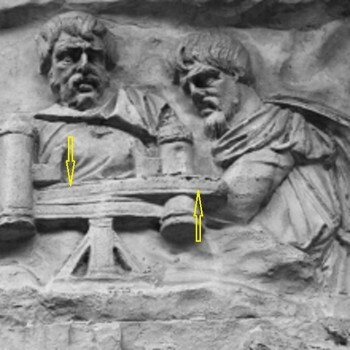 Ancient formulas vs. artifact analysis in iron frame catapult reconstruction. My research accomplice in all things inswinger, Mr. John Payne, has kindly forwarded this paper by Mark J. Schiefsky. 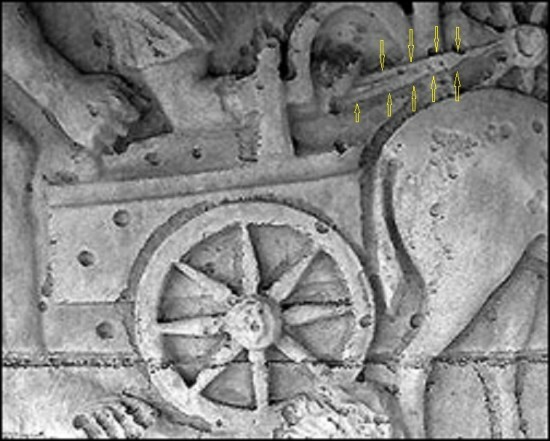 Technē and Method in Ancient Artillery Construction: The Belopoeica of Philo of Byzantium. It contains an excellent synopsis of Philon’s wedge machine. 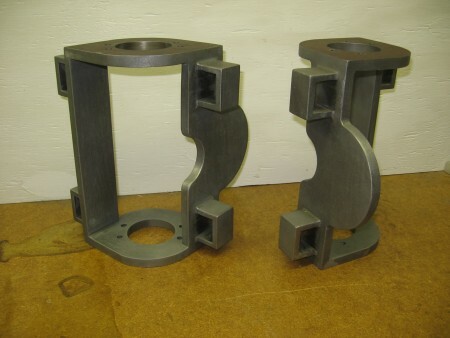 There is also an extended treatment concerning the usefulness of the spring hole diameter in figuring the proper scale for making a torsion engine. 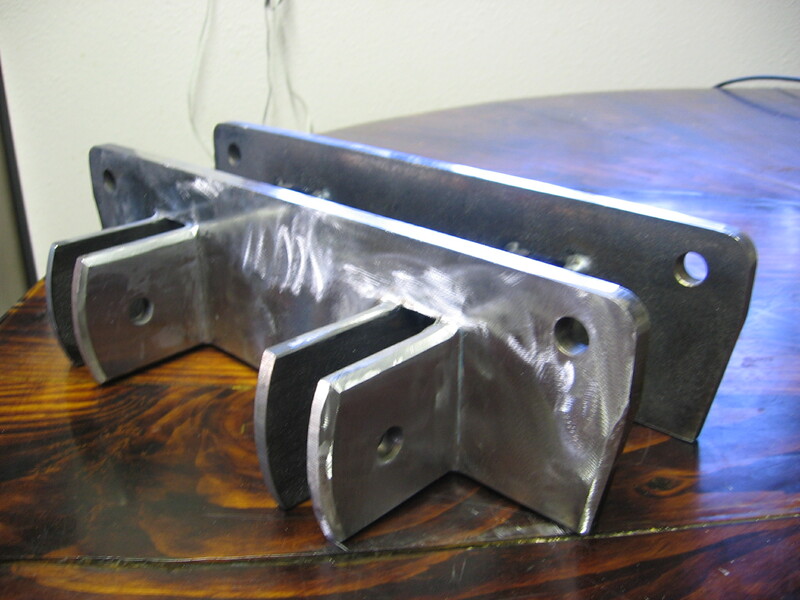 Our work on the Elenovo machine has utilized both the spring hole diameters and the height of the kambestrion to make size comparisons between the Elenovo and the Orsova machine. The Orsova machine is vital in our work on the Elenovo because it’s only surviving kamarion gives us a clue as to how far apart the two kambestrion are on an iron frame ballista. Similarly, the Lyon machine gives a clear idea of the spring proportions because it contains not only the spring holes in the kambestrion, but also the washers and crossbars. All vital for deducing the spring height. And so, while the spring hole diameter is very important in fixing the scale, it is not the only dimensional consideration when making an artifact based reconstruction. Given the errors that can accrue when making decisions based only on ancient formula, no matter how esteemed their pedigree, I prefer to stick with the things actually dug out of the ground. In the end, this approach seems more in keeping with my trial and error, workbench methodology. *Previously referred to as the “stock”. From Murray’s website comes this next photo. (3) The strength to protect the innocents, without letting that power turn you into something like the monster you’ve just defeated…. The internet machine just produced this high quality looking work by Professor Wilkins et al. Based upon my experiments with Firefly, it is my contention that if this ballista is run at high enough levels of strain to produce any meaningful performance (e.g. several times more powerful than a hand bow, 600 plus yards etc.) then the cords that wrap over those squarish corners on the crossbars would be severely damaged after only a hundred shots or so. Even if our experiential evidence in this matter is not convincing, a quick thought experiment should settle the matter. Which spring do you think would have the better longevity? The one that wraps over a crossbar with squarish corners and only a small radius on it’s edges for protecting the spring cord? Or the one that wraps over a crossbar that has a full radius on it and where the stresses are much less focused? Just ask a rock climber or fisherman or any kind of professional that actually works with ropes — when there are serious stresses involved, obviously the full radius version gets the nod for being rope friendly. So again, what’s with the square crossbars with minimal radii on the stress points? If you are familiar with all the artifacts, clearly these squared-off jobs are part of the historical record, as are the full radius versions. They had them both. And yet, it’s not like the Romans would be afraid to cough up the extra work to make the square ones properly rounded. With some simple forging and a spell on the grinding wheel, putting a full radius on a crossbar is not difficult to do at all. I just don’t figure square crossbars without some extenuating explanation — like Philon’s wedge thing I keep beating on about. Probably none of this seems remotely important if you have never made and operated a truly powerful torsion engine for many hundreds of shots. If you have, then perhaps you understand why I consider this whole discrepancy a fairly major clue. Wherein Nick uses his blog to record some vital stats. Phoenix is all ugly in blue masking tape, old vacuum cleaner tubes, and modified broom handles from the dollar store. She donned all this get-up in order to reveal her vital stats. Which are: With 22″ limbs, Phoenix has a maximum of 32″ of draw length before the string angle runs afoul of the fletching on the bolt, and at this draw length the limbs have 55 degrees of rotation. 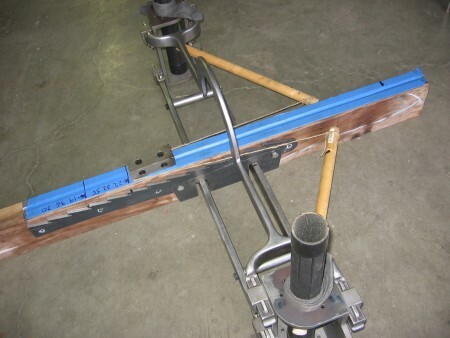 With 19″ limbs there is 36″ of draw, and 70 degrees of rotation. When I scale Firefly’s limbs down to fit Phoenix, the limbs for our new machine need to be 19″ long. Therefore, with Phoenix, we will be testing limbs that are, proportionately, no shorter than were used on Firefly, and considerably longer if we choose. It’s extra points in this game if you can seek out some rationale for the shapes that you choose based on the historical record. 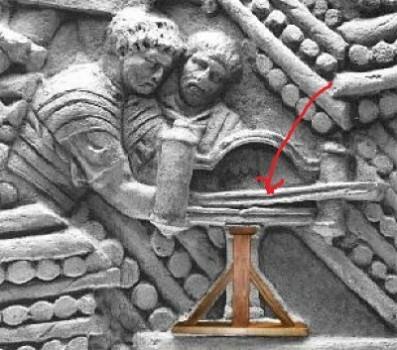 Assuming that this first photo shows the forend from a side view, which seems consistent with the perspective offered by the legionary’s forearm or the sides of the cart, then we may be getting a glimpse of the angled nosepiece on an inswinger. On Phoenix I would no doubt fatten up this basic shape to look more like this. 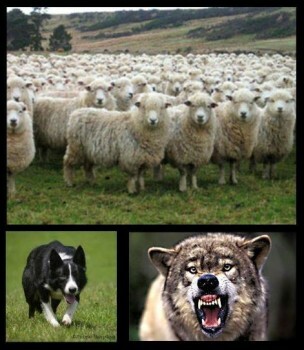 Although I can’t pretend to be altogether convinced by this reasoning…. By highlighting the lethal pointy thing that will be hurled at the enemy, this twisted perspective interpretation seems consistent with the artist’s probable desire to render an exciting and dramatic account of all the brave goings-on. And with that, I think I just demolished the first part of this post. Which is probably a very good thing to have happen. The Catapult God’s favor a bit of self-destruction. Sorry for wasting your time. However, because this blog is also a diary, I need to leave this post up as a record of my thinking at this point in time. 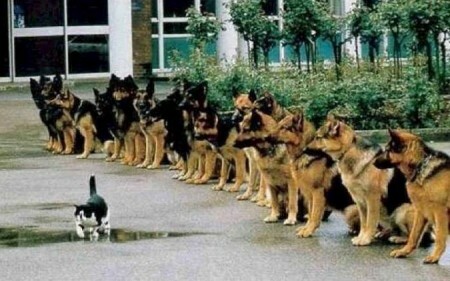 Ambiguity can be healthy when it is accepted as such. Considering this Wiki info, maybe this forend view is a clever case of double, twisted perspective. Perhaps some wily sculptor sought to give us both the side view and the plan view, all in one seamless bit of artsy-ness. In which case, maybe the first part of this post should be undemolished. Perhaps now, blazoned on Trajan’s column, we have our first glimpse of an ancient inswinger’s signature forend shape. If I could find a way to include any more perhaps’s and maybe’s in the previous paragraph, I probably would. Of rails, forend extensions, and wobbly strings. Whatever those incised lines are meant to represent (shown by the yellow arrows) they do not appear consistent with a conventional dovetailed slider assembly. Again, I’m betting they are rails of some kind. *Forend — traditionally this is from gun terminology and refers to the forward horizontal surface underneath the barrel that is gripped by the supporting hand. I’ve borrowed the term for use here. Design theory behind the extended forend and rounded nosepiece. Our work with Firefly has shown that with a powerful inswinger there is a tendency for the bowstring to foul on the underside of the forend if it is not guided back into position by a rounded nosepiece similar to the one Firefly is sporting. This is because in the microseconds after the power stroke the string wobbles around all over the place. The more powerful the machine, the greater the limb bounce and attendant string perturbations. 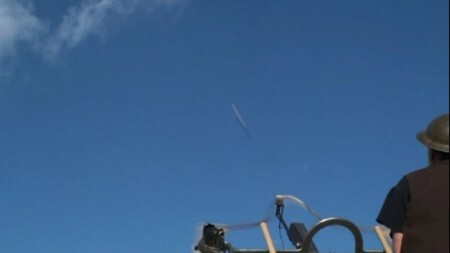 Here is a photo of the bowstring ballooning forward into an arch shape at the moment of firing. Not shown is how the string also moves several inches up and down as it snakes itself back to a resting position. This up and down movement is what causes it to slip under the forend sometimes. I never did take any photos of how the bowstring appeared those few times it slid under Firefly’s forend, but with the high poundage tension it had in this fouled position, trust me it was a pain to resolve out in the field. In my experience, a downward slope on the nosepiece is essential for an inswinger to operate properly. Some might suggest that it would be a good idea to have the forend terminate exactly where the claw grabs the bowstring when it is in the resting position. This truncated approach to forend design can be problematic because the pick-up point for the bowstring can vary depending on the limb length. Also, any kind of flat end for such a nosepiece would be something for the bowstring to snap against as it recoiled, and that would not be happy for the string at all. I suppose it is possible that if the forend extension was long enough it could extend beyond the farthest reach of the string and function fine that way. In which case, an angled nosepiece would not be required. Perhaps that is what we are seeing with that first photo and the drooping forend. 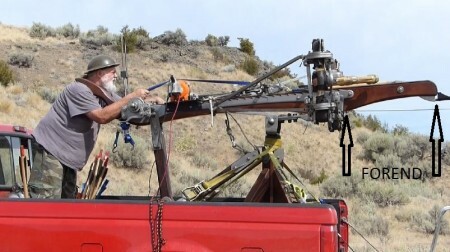 Or, for that matter, the long forend seen in the ballista pic from yesterday. Also, with inswingers it is essential for the flight deck to be under the bowstring in the resting position. The claw is not a complete hook as it needs to be able to let go of the string for firing. In other words, it is the claw and the deck both that form the lock on the bowstring. Therefore, the deck, and forend that supports it, have to at least reach out as far as the resting bowstring. The existence of an extended forend of this sort can be considered as indirect evidence for inswingers, because for them they are a necessity, whereas for outswingers they are largely superfluous. What is the claw? That’s the curvy thing that holds the string for the pull back, and then lets it go for the shot. What’s the deck? That’s the flat metal runway on the top of stock that the bolt trundles down. If you mooch around the pics in this blog for a bit, all will become clear. “Down the catapult hole” — Definition: similar to “down the rabbit hole”, although at considerably higher velocity due to uncontrolled ballistic enthusiasms. Generally considered a dangerous condition. The above is from Mr. T’s column. Fighting the Dacians, or whatever. Of interest here is the incised line in the stock of the machine, shown by the red arrow. Here is a bobble for all you Occamists to chew on. 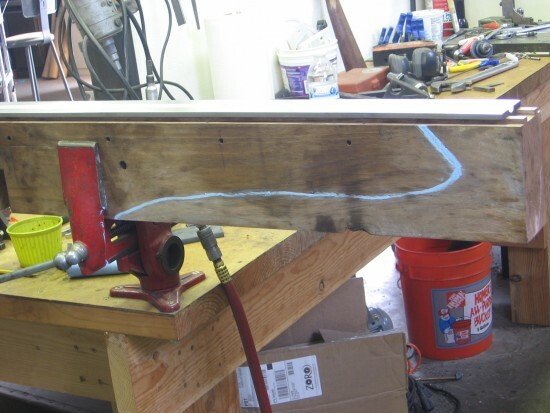 The simplest, literal interpretation of this wide and deep line, running along the side of the stock, is that it is the groove needed for a rail system. Note the “incised lines” for a rail system at points 1 & 2 in the sketch below. A rail system provides the moving trigger block assembly with much improved tracking on the flight deck. No more excessive clearances to prevent a wood slider from sticking in wet weather. No wobbly bits to ruin accuracy. No ungainly slider hanging out in front of the machine to give away your position or limit movement. Not much to break or go out of tune. Very good. I rest my case. Well that all sounds very emphatic. Actually, I’m perfectly happy to admit that a conventional slider is still a highly likely interpretation. However, please remember our virtuous addiction to “new and improved” when dealing with iron frame artifacts that are so revolutionary that they proclaim “New & Improved” at every turn in their unique geometry. At least compared to all the wooden machines from previous centuries. Failure to consider new paradigms is not logical when faced with evidence of revolutionary goings-on. Ever on the lookout for helpful congruencies, I’ve been pondering this passage from Philon’s dissertation on his blessed wedge machine. 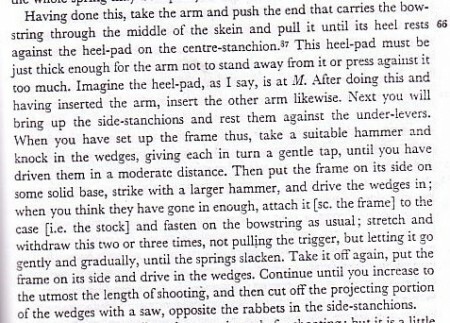 Having gone through this basic drill many times, with the exception of not having played with the wedges yet, I am struck by how competent Philon sounds. 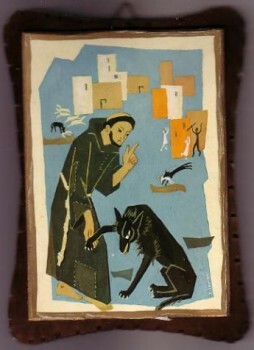 Some ancient authors, when you read them, there is a general unease about their credibility, whether they have actually done something, or not. In my humble opinion, Philon really knows his stuff. I have high confidence in this wedge plan. Other, perhaps, than the question of the stability of the wedges perched atop the crossbars. It will only be possible to build up their height by a certain amount. Skyscrapers ain’t gonna cut it. This is because the base of the wedges cannot be any wider than the flat on the crossbar, and the crossbar needs to keep it’s width down to allow all of the requisite spring cord enough clearance to feed into the hole in the washer. The knee bone is connected to the hip bone is connected to the toe bone ….. 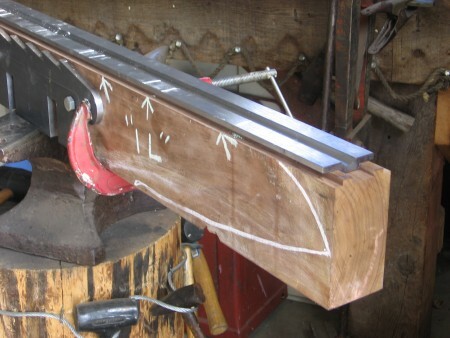 The key will be to carefully control the length of the spring when it is originally wound up on the jig. This is actually very easy to do. See vid in previous post. With a spring of just the right length, and a crossbar of just the right depth, the working space for the wedges should be entirely predictable, and the height of the wedges can be kept quite low. Two counterposed steel wedges (or perhaps steel and bronze) shouldn’t project much more than inch above the crossbar, if it’s done right. Shallow angles on the wedges will be the key here. Shallow angles will also maximize the power of the wedges to stretch the bundles out straight and tight. 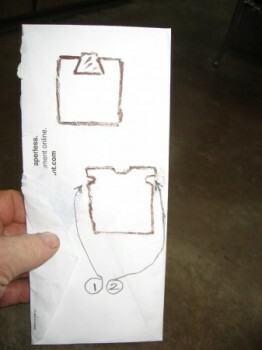 Also, if the collars on the washers are tall enough, and rebated in the space between the notches, more space can be gained for the spring cord, and the crossbars can then be increased in width a useful amount to help stabilize the wedges further. On the crossbar, I’m hoping for a 5/8″ wide flat, 6″ long, for the wedges to push against. We should not underestimate the level of force that will be sucking the wedges directly down onto the crossbar. 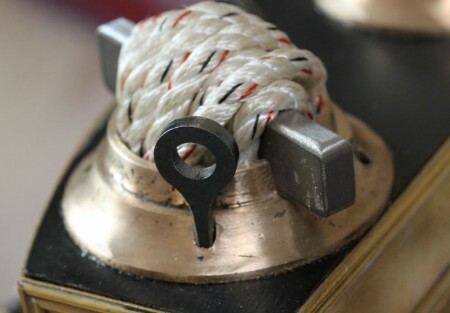 As the spring cord wraps over the wedges, all of the spiral forces extant in the working parts of the spring, will be highly controlled and made straight by the crossbar. When I add up all of the specifics in my imagination, I see no tendency for the wedges to tip here. …. Not if it’s done right.